Since the 1990s, city branding has become a key factor in urban development policies. Cities all over the world take specific actions to manipulate the imagery and the perceptions of places, both in the eyes of the inhabitants and in those of potential tourists, investors, users and consumers. 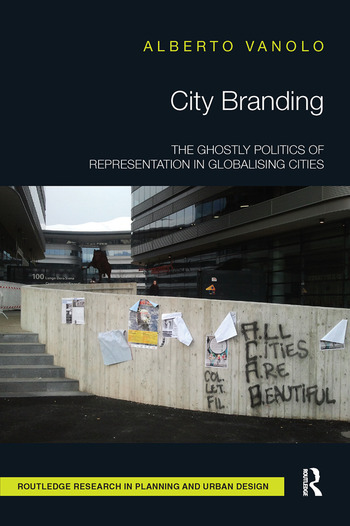 City Branding: The Ghostly Politics of Representation in Globalising Cities explores different sides of place branding policies. The construction and the manipulation of urban images triggers a complex politics of representation, modifying the visibility and the invisibility of spaces, subjects, problems and discourses. In this sense, urban branding is not an innocent tool; this book aims to investigate and reflect on the ideas of urban life, the political unconscious, the affective geographies and the imaginaries of power constructed and reproduced through urban branding. This book situates city branding within different geographical contexts and ‘ordinary’ cities, demonstrated through a number of international case studies. In order to map and contextualise the variety of urban imaginaries involved, author Alberto Vanolo incorporates conceptual tools from cultural studies and the embrace of an explicitly post-colonial perspective. This critical analysis of current place branding strategy is an essential reference for the study of city marketing. Alberto Vanolo, PhD in spatial planning, is associate professor of political and economic geography at the University of Turin, Italy. His main research interests include urban studies and cultural geography. He is associate editor of the journal Cities.